Our all-new design takes hands-free mobility to a whole new level! 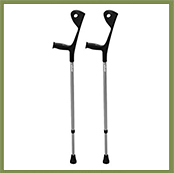 Lightweight, durable, comfortable and inexpensive, the world’s best-selling hands-free crutch just got even better! use. Proprietary glass reinforced thermo-plastic paired with engineered forms, keeps Comfortable woven straps have fabric-covered foam pads, easy infinite adjustment and quick-release buckles. Donning and doffing takes Integral handle makes leaning easier and allows short trips without strapping in. 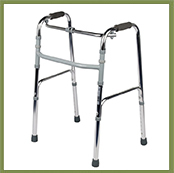 Triangulated alloy tube frame enhances user stability. 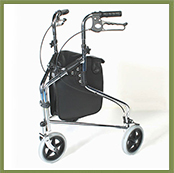 Ergonomic knee platform shape provides greater comfort and control. 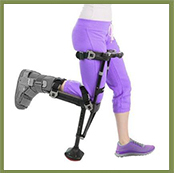 Independent upper and lower leg height adjustments makes fitment fast and easy. 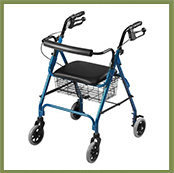 Rigid, independently adjustable thigh cradles provide enhanced stability and simple tool-free size adjustments. 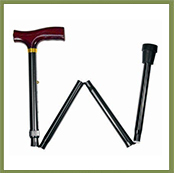 These are everyday assistive devices for patients who struggle with walking or who recently had an operation that requires them to reduce weightbearing on a certain limb. These devices have the main function of assisting with moving around the house with as little as possible strain on the injured limb. Some of the devices are for short term use such as post operatively, but other devices are available for patient who need them as part of their everyday life.